Yes, really! Green Toys is one of the most innovative eco-friendly companies on the planet, committed to using environmentally friendly materials in everything they produce, from their unique line of recycled plastic toys, right down to their 100% recycled cardboard packaging that comes without the usual mess of twist-ties and glue to cause frustration for anyone having to open them and delaying the joy of a child waiting to play. The recycling truck is a perennial favourite, not only for its unique design with no metal axles and slots for sorting recyclables, but because it also fits so perfectly with the “green” message we can pass on to our children in a fun way. It’s also important to note that these toys contain no BPA, PVC, phthalates or external coatings. They’re food-safe and are also safe for babies to teethe on. Put out 3-alarm blazes. Rescue kittens from treetops. Protect the environment from harm. This is just a typical day in the life of the Green Toys Fire Truck, the world’s greenest emergency vehicle. Watch how this truck (and all it’s features) work in action with this YouTube video. 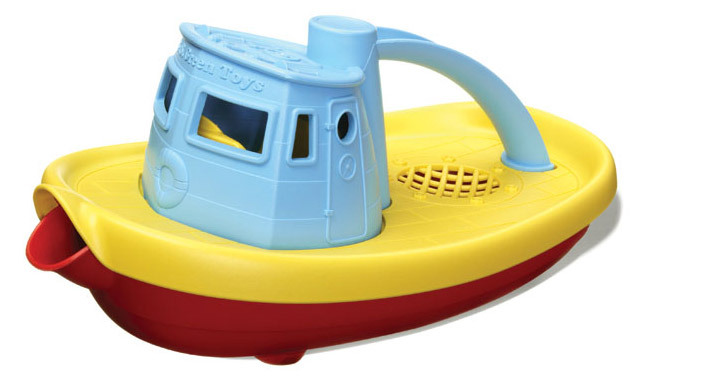 There’s no end to the good green fun young sailors can have with the Green Toys Tugboat. This colorful craft floats and has a wide spout to scoop and pour water. It comes in 3 colour combinations too. Watch kids playing with it here. Available in blue or pink, this cool hot rod is better than any hybrid, and proudly displays the #2 recycled plastic symbol from which it is made on its hood. All 18 boldly coloured blocks are oversized and lightweight, making it super easy for tiny hands to stack and unstack. This unique block set includes a variety of shapes for building castles, towers, or any imaginative structure budding architects can dream up. Watch the YouTube video of kids in action with these blocks. The eight whimsically coloured nesting pieces stack easily from large to small, while also allowing little builders to use their imagination and stack in any order. This toy has won multiple parenting awards – see how real kids use it here. Pizza lovers can pretend and play chef and server by taking orders, creating custom pizzas, and serving guests. This colourful 27-piece set features four slices that can be stacked with toppings galore to dish up any personal pie. Young chefs can open their own imaginary cafe and take orders, create sandwiches and serve guests. This 15-piece, stackable, mix-and-match play food set comes with all the fixings to create two complete sandwiches. 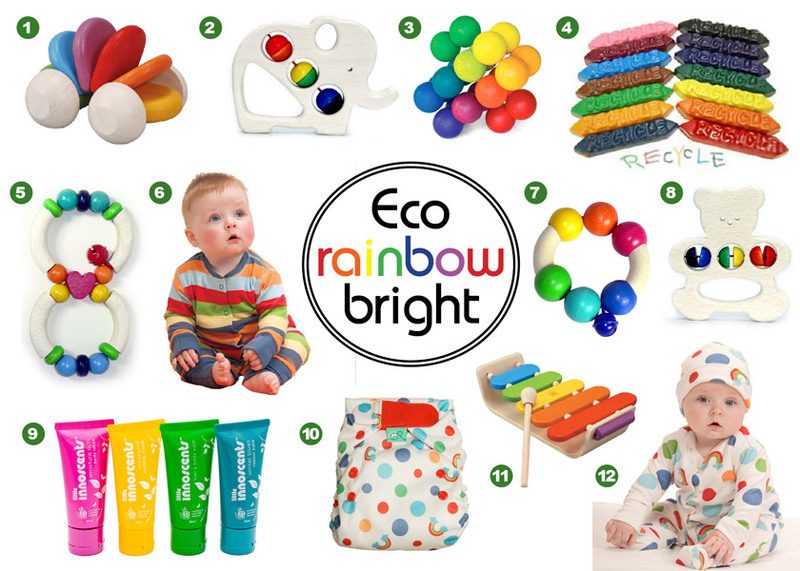 For more information on Green Toys, visit their website, where there’s lots more information about how the brand started, what others are saying about them, and they even keep a running tally of the number of milk jugs that have been recycled to date. 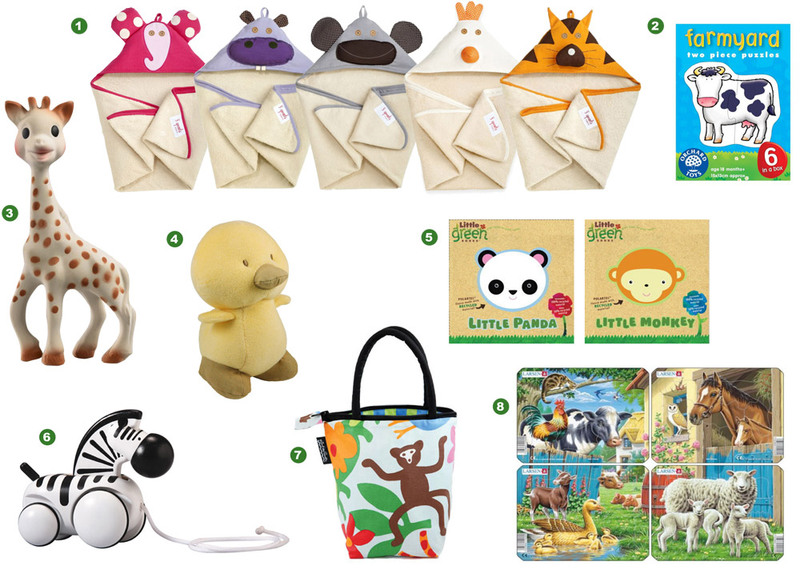 To celebrate the release of Green Toys’ new line in Australia, Itty Bitty Greenie is offering the complete range at 20% off until the end of May, and as always, we gift wrap for free! Inspired by my own love of animals, (and the joy I get from watching children learn about animals and all their noises), here are some gift ideas for the Itty Bitty Animal Lover. For nearly 50 years Sophie the Giraffe has been loved by babies all around the world, and she has become an iconic toy that has been passed through generations, a favourite among celebrity mums, old-school mums and modern mums alike. But what makes me love this classic teething toy so much more, is the fact it is also eco-friendly, all natural and toxin-free. For those who don’t know her heritage, Sophie was born in 1961 in Paris. She is made by the French company Vulli, located in the French Alps, from 100% natural rubber derived from the sap of the Hevea tree that grows in Malaysia. Every morning, before the daytime heat sets in, the milky liquid latex that oozes from beneath the bark of these trees is collected. Vulli then applies a traditional process of rotational moulding to shape the rubber into Sophie as we know her. Amazingly, each Sophie is still produced traditionally, involving 14 manual operations before completion. With more than 30 million Sophies sold around the world, that’s a lot of manual labour! It’s no wonder this sweet little giraffe has become the star she is today. 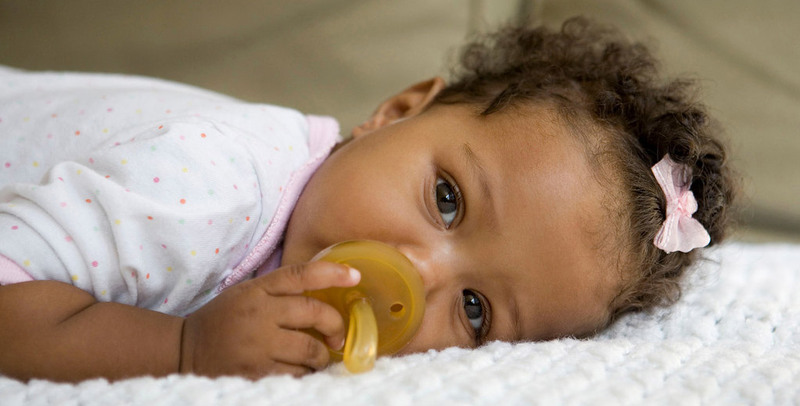 Soft and soothing, the perfect size to hold and chew, Sophie comforts and pacifies babies like no other toy or dummy can. Buy Sophie here and we’ll gift wrap her for free!